Owning your own home is one of life's great adventures. There is nothing like having a place to come to and relax with your family and friends. Owning your own business can be a great thing and Michiana Paint can help make it yours. Whether its a small personal touch or a complete redo, Michiana Paint can do it all. 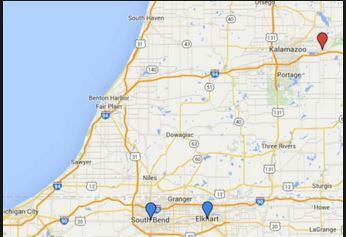 Michiana Paint covers the entire Elkhart, IN area. They can do everything you could possibly need in your new home. From simple accent walls to a complete room, Michiana Paint can do it all. They have the most professional contractors around. There is nothing Michiana Paint can't do in the Elkhart, IN area. Michiana Paint does work all over the South Bend, IN area. They know what the city wants in their painting contractors and they deliver. They come into your house and make sure you know what you want before a brush or roller is touched. They know that your home is where your life takes place and having a stranger come in can be quite disrupting so they get in and get the job done the first time which saves you time and money. ​Michiana Paint will take care of you no matter where you live in the Goshen, IN area. Owning a business in Goshen, IN can be quite rewarding and getting the look of your business right can be quite the ordeal but the good folks at Michiana Paint can take you through everything step by step. Whether your business needs the whole building painted or just a small room Michiana Paint can take you there. Michiana Paint is your number one painting service in the Mishawaka area. It doesn't matter if you have a commercial property or a residential property Michiana Paint can do it all. Whether its a new look for your business or a new accent wall for you home, Michiana Paint contractors are the best choice for you. Michiana Paint has the most professional workers around they will make sure you are happy in your business or your home. Michiana Paint is Edwardsburg, Michigans best painting business. They know what you want, whether its for your home or your commercial property. They that time is money and they get things done time. They know that you want to get on with your life and the last thing you want to have to do is paint. They can take care of all your painting needs with no problems at all. Michiana Paint takes Granger, IN and gets all the painting right. Need a room painted? Michiana Paint can do that. Need an entire building painted? Michiana Paint can do that too. Michiana Paint are the most professional contractors in the Granger area. They know that you want your life to flow and having someone doing work around your home or your workplace can be quite the pain. Michiana Paint is the best painting service in the Granger area.